We thought about having our kitchen cabinets painted for the last couple of years and put it off due to the high cost (I heard $2500-$3800 for our area). That was just not what I wanted to spend! We did the entire project for $150 and bought the best paint that I could find along with the products that were highly recommended. I could have probably done it for $100 but I wanted for it to be done right, for it to look amazing and to last for years to come. The whole project took 5 days. I’m not talking about 5 lazy days but about 5 days of working most of each day working on the cabinets. Our motivation to get them done quickly was that the kids would be grabbing the items out of the open cabinets and I wanted our house back in order quickly. Plus, I couldn’t wait to see the results! We have oak cabinets and after looking at many tutorials, decided that I didn’t want to see the grain on the wood anymore. I spent about 10 straight hours of manual labor using a wood filler on the cabinets and then sanding the extra off. If you do not mind seeing the grain (the lines in the wood), you can skip this step and it will save about one whole day of work. I wanted to do the project the right way so we spent the extra time. I did this part by myself. It took about 30 minutes to remove all of the handles and pulls. I should have used a drill to remove the hinges from the cabinets but I did it all by hand because my husband wasn’t home and I would have needed a little instruction on using the drill lol. This took about 2 hours. I setup all of the cupboard doors and drawers on paint cans and pieces of wood that we had. We laid it over paint tarps. Using Krud Kleaner Original, Troy and I cleaned both sides of the cupboards really well. Paint won’t stick to grease and grime and trust me, your cupboards are dirtier than you think. This took maybe an hour for 30 doors. We rubbed a deglosser all over the cabinets to remove the gloss to make sure that the paint will be able to stick. Steps 1-4 were done on day 1. We used an Elmer’s wood filler to fill all of the grain on the trim and the front of the cabinet doors and drawers. We did not do the back of the cupboards and I good with this. This honestly took me about 4 hours straight to do. It is decently labor intensive but after painting, the results are super worth it. The back of the cupboard doors still show the grain but the fronts do not. We think this extra work was worth it. I used a putty knife to put it on the entire front of the cupboard. I do not necessarily recommend this type of wood filler. It wasn’t bad but just dried quickly making it more difficult to work with. Use a VERY thin coat because any excess, you will spend forever sanding off. Wood filler dries quickly in 15 minutes so once it is dry, you can sand it off. I used 120 grit sandpaper. This took me about 4-5 hours straight to do. While you’re sanding, keep feeling the cupboards to make sure that it is very smooth. You will see any imperfections once the paint goes on it. I did the entire wood filler part by myself while my husband was at work. The rest of the project was done together making it go much faster. You’re not going to want any dust on your cabinets so the guy from the paint store recommended taking the removable handle off your vacuum and putting the brush on it and vacuuming the cupboards to remove most of the dust. Then, I used a $1 piece of tack cloth and wiped down each cupboard to make sure that all of the dust was off. We used Kilz Max Maximum Stain and Odor Blocking Primer which worked really well. We did one coat of primer on each side and over all of the trim. Before painting the trim, I spent about 10 minutes taping up areas that could potentially get paint on them (the blue tape is the best!). Priming didn’t take long. We let it dry overnight. Steps 5-8 were done on day 2. After so much research, I decided to paint our cupboards with INSL-X Cabinet Coat Acrylic Satin. We are happy with this choice. I bought it at a local store that sells Benjamin Moore paint and had it dyed in Benjamin Moore White Dove (OC-17). I chose this color because the professional at the paint store said that that is by far the most popular color. I looked at it and thought that it would be perfect. Please don’t skimp on quality paint. I’ve read so many bad things about cheap cabinet paint and certainly, you don’t want chipping after all your hard work. I read tips to use a 6-inch foam roller to paint the cupboards so that’s what I did. I actually bought all of our supplies off of Amazon except for the paint. The paint is self-leveling meaning that if you have brush strokes or roller marks in the paint, it will level itself flat. This worked really well and everything looks super smooth. We painted the back first in case anything got messed up when we turned it over and were happy with this. We did two coats on the back along with 2 coats all around the trim on day 3. We used a brush and a foam roller and went around together and did a mixture of brushing the corners and rolling the paint. Day 4 we did two coats of paint on the fronts of the cupboards. It needs a full 24 hours to dry after your last coat before hanging the cupboards so we waited that time. End of day on day 5, Troy reinstalled the hardware and hung the cupboards by himself while I was on a trip! What a guy. He said that it needed a bit of paint touch-ups after installing which he quickly did. Fix any errors that you see before you finish the job because it is more work to go back later. Enjoy your hard work! I am so thrilled that we finally decided to paint our cupboards after being scared to for so long. I didn’t want a shotty job and think that it turned out awesome. It really brightened up our kitchen and made it look up to date. I highly recommend painting your cabinets yourself if you’re willing to put the work in to save a lot of money. Feel free to ask any questions you have! I am not an expert but just someone who mostly enjoys DIY to save money. Going to do this in our rental. Thanks so much! Best of luck to you! 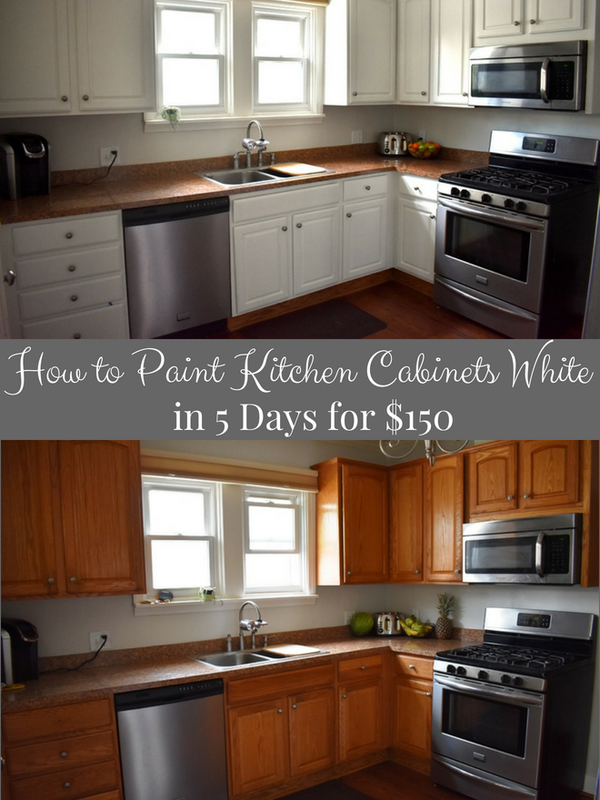 I've been wanting to paint my kitchen cabinets white for so so long, but sorta afraid :) You break it down and make good results seem do-able. I may just give it a try. One thing I worried about with going white was dirt,grim, cooking greasiness (especially on the cupboards right above the stove) etc. I was wondering if there is a top coat that can be applied over the white paint to make it super easy to wipe the cupboards clean every now and then without damaging the white paint...... or can the paint you chose be cleaned without dulling the white paint or having it get a dull yellowing or something? As you can see....I'm still a little scared about going white in the kitchen, but I love the look and have wanted to do this for years now. With the grease, you need to clean it really well with Krud Kutter. It worked like a charm. We spent quite a while cleaning the cupboards with this to ensure that the grime came off. We chose a paint that is supposed to wipe clean easily. I was so scared too which is why I researched it for days. Seriously, I read every single article that I could find to make sure that I was doing it right and didn't mind spending more on high quality products to make sure that it was done right. Feel free to ask anything else! I'm curious how different the backs of the cupboards, with the grain, look from the front. Your kitchen looks amazing! Thank you! You can definitely see the grain on the back. Just depends what kind of look you want. The grain still looks good but I preferred the smooth look. My husband and I both said we were happy with filling the grain. Thanks so much Heidi! I followed the instructions on my paint can which depends on what kind of paint you use. For us, it was 6-8 hours. That's why I didn't use Benjamin Moore Advance which was another recommended paint because the time between coats was much longer and I didn't want to wait. I would love if you would email me a before and after pic if you get a chance- achernandez711@yahoo.com. Good luck! Thank you so much for replying. I am literally using the same brands that you did to cut out any inconsistencies. I have to tell you I did treat myself to a power sander for my sanity. I am trying to fit in project time in between work time. I would absolutely love to show off when I’m done, I’m hoping in the next two weeks.